Not only is Gok Wan one of the UK's top fashion stylists, but he can cook too! 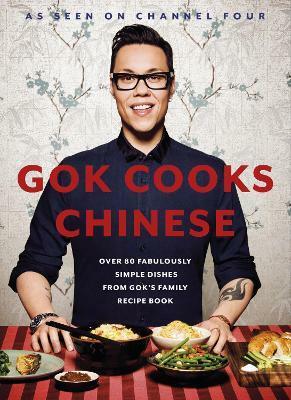 Gok's fantastic book, Gok Cooks Chinese, contains 80 personal and family recipes, which are not only delicious and healthy but incredibly simple to make. Gok's love and passion for Chinese food and cooking techniques shine through from every page. From his unique perspective he gives us his personal and modern take on the Chinese food that he grew up eating, drawing on his Chinese heritage to give us a different angle on how to eat - for Gok, it's all about sitting down, tucking into fantastic food that is fuss-free and relaxed. Gok's food is about balance, health, flavour and fun. From his absolute favourite recipe for Prawn Wonton Noodle Soup (which he calls 'happiness in a bowl') to Perfect Fried Rice or classics like his dad's Honey-glazed Char Siu Pork, through chapters on Dim Sum, Street Food, One Pot Wonders and Feasting, you will find recipes for all occasions and moods, whether entertaining friends or enjoying a meal at home by yourself. Above all, Gok Wan will demystify Chinese ingredients and equipment. Gok Cooks Chinese shows us how easy it is to shop and cook just like him. Acclaimed fashion stylist and on-screen consultant Gok Wan was shot to fame by his Channel 4 Series, How to Look Good Naked. On the back of the show's success, Gok crystallized his position as a true champion for women with Gok's Fashion Fix and Gok's Clothes Roadshow, helping them to feel confident and stylish. This has led to his enormously popular women's wear collection for Sainsbury's, released in October 2011. He has published four books, including his autobiography Through Thick and Thin, and his openness about his own weight issues as a teenager led him to film two searching documentaries, Too Fat Too Young and Gok's Teens: The Naked Truth. Optomen Television is an independent production company the forefront of the food television revolution both in the UK and the US, known for the flair and originality it brings to its productions. Making shows for all UK broadcasters, Optomen has launched the television careers of household names, including Clarissa Dickson Wright and Jennifer Paterson, Jamie Oliver, Gordon Ramsay and Valentine Warner.